Honouring the Memory and Advancing Professional Nursing. Image courtesy of the State Library of Queensland. The Centaur Memorial Fund for Nurses (CMFN) was established in 1948 as a non-government organisation dedicated to the memory of the nurses who served in the Australian armed forces. The Memorial in the name of Centaur has come to symbolise nursing and medical personnel serving in all theatres of war. The mission of the CMFN is to preserve and maintain a living War Memorial in honour and remembrance of Nurses in the Defence Services of Australia (ADF) at home and abroad. The history and legacy of the sinking of the Australian Hospital Ship (AHS) Centaur. Links with organisations that hold similar missions and objectives. The values and work of nursing generally, and the ADF in particular. Convene an annual service of commemoration that honours those who serviced AHS Centaur. Excerpt from “CENTAUR” SURVIVORS TELL STORY.” Excerpt length 27 secs. On May 14th 1943 AHS Centaur was travelling toward New Guinea fully illuminated and identifiable as a hospital ship according to international standards. At 0410 hours on the 14th May 1943 she was torpedoed and sunk by a Japanese submarine. 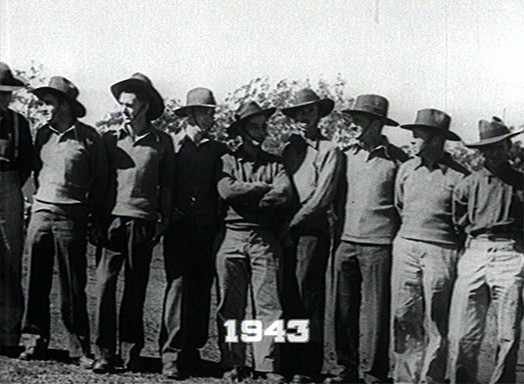 On board were 332 personnel comprising the crew and a team of Army nurses. Tragically there were only 64 survivors, one of whom was Sister Ellen Savage, the only surviving nurse. Sister Savage was awarded the George Medal for her courage, care and endurance during the 36 hours that survivors drifted at sea until finally rescued by the USS Mugford. The editor of the Brisbane Telegraph wanted to help found a fund that would stand as a perpetual reminder of the AHS Centaur and honour all nurses who served in wartime. The appeal raised £48,000, a great deal of money for the time. 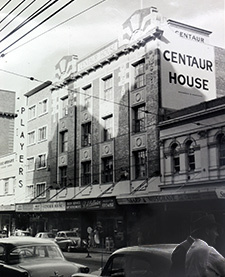 These funds purchased Centaur House at 337 Queen Street (where Central Plaza One stands today). This served for many years as a meeting centre and hostel for visiting and local nurses. In the 1970s Centaur House was sold and the dedication of the management committees over the years and their wise investments have enabled us to maintain our mission for advancing professional nursing in Queensland. Today we promote nursing scholarship through academic awards and research grants specifically for Queensland nurses from all regions. Bought and refurbished as a home for the use of all Queensland nurses after the Brisbane Telegraph appeal. Image courtesy of the State Library of Queensland. All images courtesy of the State Library of Queensland. Dr Madonna Grehan – was awarded a John Oxley Library Fellowship through the State Library Queensland awards in 2015 for $20,000, to research the history of the Centaur Memorial Fund for Nurses – ‘a long-lasting & serviceable memorial’. The Fellowship includes the library resources and office for 12 months. Ms Pixie Annat MBE OAM, Mrs Rosalie Lewis AM, Dr Linda Shields, Dr Leanne Jack, Mrs Claire Lees, Dr Jan Pratt AM, Ms Snezana Stolic, Dr Judith Dean, Dr Grace Croft. President’s address delivered at the 2018 AGM, held on 26 March 2018 at United Service Club. Special Resolution regarding corporate membership of the Fund.